Icons of the opposing poles of the Force! 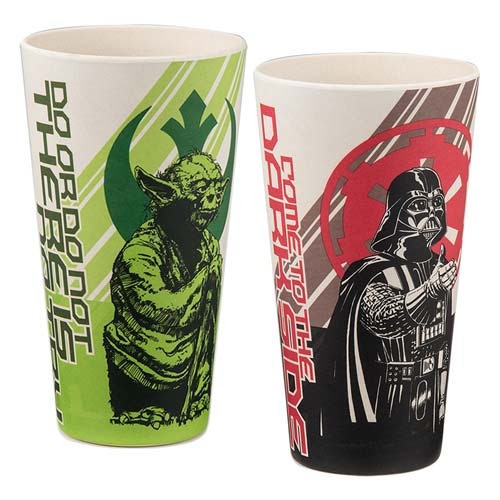 Made with bamboo fiber and cornstarch, a renewable environmentally friendly alternative to plastic, this Star Wars 24 oz. Bamboo Tumbler 2-Pack features two 6 1/2-inch tall glasses. One presents two different images of Master Yoda and his name, and the other shows dual images of Darth Vader and his moniker. Yoda's tumbler also bears the words "Do or Do Not. There Is No Try," while Vader's says "Come to the Dark Side." Packaged in a full-color gift box, they're dishwasher safe. Do not microwave. Ages 13 and up.